A blend of luscious, natural vanilla with lightly roasted coffee. 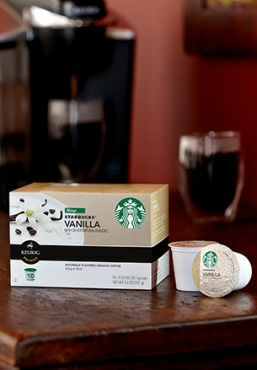 A generous kick of vanilla flavor transforms coffee into a deliciously satisfying treat. Our recipe is an enticing blend of lighter-roasted beans and vanilla flavor that you can enjoy anytime. Add some tasty fun to your cup before brewing: ground cinnamon, brown sugar, or hot chocolate mix. A butter cookie, French toast, chocolate and other indulgent treats.